Who’s coming up on Monday March 13? In this business, sometimes the best laid plans do not always pan out. So when the vision is ambitious but details still a bit wabi-sabi at the onset – such as not really knowing how many artists are coming; who is going to show up or not show up, when the actual event is set in motion and more — it begins to take on a life of its own, there is a kind of electric spontaneity that defines the way the evening turns out. Who is there and how each person relates to the moment seems to be a key factor. Such was the case when Ka Hale ‘Auamo members Sean Naleimaile, Kihei Nahale-a and Kamakoa Lindsey-Asing presented their “Project Kuleana” to the EKK audience. This is a project in which the participating artists statewide take responsibility, or Kuleana through Na Mele Hawai’i by recording sequential lines of a song that are then spliced together. Truly a haku mele, where each recordings, filmed on the home turf of the artist, shows inspirational surroundings of his or her music, and its skillfully braided together into a whole. Of course, having the likes of music producer/engineer David Tucciarone on the production team makes a huge impact on its success. You can see the videos on youtube.com. Our roster of stars began the evening by showing the video Kaulana N? Puafollowed by a talk story on the background of the project and several of the musicians sang, led by Kauai?s own Carlos Andrade. He taught a song about family and being grateful for all that we have, and he shared some quotes, such as: “Getting old is not for sissies” and “Getting old is a privilege.” Dennis Kamakahi, one of Hawaii’s most prolific songwriters, shared that Mary Kawena Pukui told him that artists need to compose songs about their life and their time just as people from the past wrote songs about their own lives. This is the musical legacy that each generation can pass on to those who follow. Appreciative applause from the audience acknowledged each Kaua?i artist as one by one, they appeared and sang in the video. They included Darryl Gonsalves, Kawika Sproat, Chucky Boy Chock, Edward Punua, Lady Ipo, Carlos Andrade and Palani Vaughan, members of whose family — Kilipaki and Mehana Vaughan, live on Kaua?i and were present to speak on his behalf. Kihei pointed out that while all the artists come from different parts of Hawai?i, collectively, they aim to get the native Hawaiian community to see from the Hawaiian perspective the inevitable changes in climate, food, the environment and its impact on life. Producers got to the task — selecting artists, scheduling them to a particular day/date/time/location on their home islands, setting up equipment and more. The result was impressive. Since the filming, several of the artists on the film have, regrettably, passed on. Leading off the concert portion of the evening, Sean on bass, Kihei on ?ukulele, Kamakoa on guitar and Edward on steel guitar played the most appropriateLihu?e by Annie Koulukou. Kihei shared musical influences he experienced starting at a young age — listening to the Sons of Hawai?i, singing in church and his father who introduced him to music. Every morning his dad set out Cream of Wheat for breakfast and put on the Sons of Hawai?i recordings. Even today, when Kihei hears any of the music of the Sons, he gets ono for Cream of Wheat. Their second song I Ka Po Ame Ke Ao (Night and Day) by Lena Salis and Vicky Silva had a lively beat so you could see heads bobbing all over the place. They then called up Kainani Kahaunaele, poet, performer, recording artist, native of Anahola Hawaiian Homesteads, a 1992 graduate of Kapa?a High School and currently living and teaching Hawaiian language at UH Hilo on Hawai?i Island. She was very happy to be on Kaua?i singing with her friends and her ?ohana. You could tell by looking around that many of the resident population showed up just for the treat of hearing Kainani sing. She called out the names of her family who had come to hear her perform and acknowledged Pancho Graham who had accompanied Kainani on his upright bass at her very first EKK gig back at Island School. She was very young then, right out of high school, and did her whole program in pidgin English. In 2004, her first CD, titled Na?u ?Oe garnered her the coveted Female Vocalist of the Year and Most Promising Artist at the Na Hoku Hanohano awards in Honolulu. As always, Kainani is beautiful, gracious and has a voice that is memorable. The students from Chanel Flores’s music program at Kanuikapono Hawaiian Charter School in Anahola stood up to welcome Kainani with an oli. The students were blown away to learn that this oli was composed by Kainani who was also one of the charter members of their school. Kainani recalls growing up in Anahola when KCCN radio was the only station allowed in her home. She used to listen to Sons of Hawai’i, Palani Vaughan, Peter Moon and Larry Kimura. Today she teaches with Larry in the Hawaiian language program at Ka Haka ‘Ula ‘O Ke’elikolani Hawaiian Language College at UH Hilo, so she wanted to sing Sweet Memories written by Larry Kimura. His story was that he was sitting next to the hot toaster in Waianae when the cool breeze from Waianae came through the window. The beautiful steel sounds by Edward suggested the soft cool breeze in the song. Adding to the impact of the song was a hula by Pua Gomes, kumu hula at Kanuikapono School. Kainani’s second song was Nawiliwili, a beautiful song about the place where her family once lived. Vern Kauanui, dressed in his festive yellow and green aloha shirt and decked out in maile/mokihana lei, needs little enticement to share his hula. Loving the audience participation, Kainani invited other dancers to come up as she sang Aloha Kaua’i. Elena Gillespie, Madeleine Guyett, Lady Ipo, Mehana Vaughan, Anna Velasco, Vern Kauanui, Pua Gomes, Donna Stewart . . . hula dancers thrilled the audience, each with her own choreography of the language of the heart. Lady Ipo shared how special it was for her and her daughter to be featured in the video Kaulana Na Pua while sitting and singing on the porch of Grandma’s picturesque old-style plantation house. Scenes like this are fast disappearing, so it’s great that a piece of it was captured in this video. Lady Ipo shared her version of Blue Hawaiian Moonlight and you could see her influence on the singing style of her daughter Kainani. One of Lady Ipo’s cousins came up to dance the hula — her family is one in which music and hula is so integrated into their way of life. Another surprise and treat that was unexpected but so appreciated was when Ipo called upon Kainani’s first hula teacher to step up to the stage as she sang the fast-paced O Kalena Kai. It was none other than the always-exciting Willie Pulawa, back from Seattle for a home visit. You could hear squeals of excitement from the audience and a lot of hana hou shouts for Willie and his kolohe style hula with Phyllis Amorin. We need to see more of this hula treasure. Lady Ipo, ever conscious about supporting Hawaiian music artists in their efforts to perpetuate the culture in music, suggested that tonight at EKK the audience show their support for Project Kuleana’s “Go Fund Me” set up for the purpose of continuing to make more videos of this nature. She offered her daughter, Kainani, to sing Phoebe Snow’s 1974 single hit Poetry Man as the incentive for the donations to the basket.The song was perfect for Kainani; her rendition was like warm syrup pouring over pancakes … a feeling of warmth and excitement at the same time. The outpouring of donations was instantaneous and constant. The three gentlemen of Project Kuleana kept sighing exclamations of surprise as many from the audience ran up to the stage to throw their donations into the large basket … all the while Kainani’s very sultry voice poured it all out. The audience was beside themselves with the unexpected treat. Kihei Nahale-a shared an amusing commentary during the performance that was a story behind his next song. His grandfather, Albert Nahale-a, loved to watch his daughter walk to school, and made him think about the Christmas song Joy to the World. You will hear the influence of that song in the beginning of He Punahele N? ?Oe, and as the quartet began to sing this lovely mele, you could surely get the surprising connection between the Christmas song and this much-loved Hawaiian melody. Another surprising connection between this group of musicians and some of our best-loved songs is Sean N?leimaile’s story about his Tutu, who was supposed to be in the Hollywood movie Bird of Paradise. One day, she was hungry for ?opihi, so she went to the ocean to pick ?opihi when the rough waves caught her and she ended up on the rocks and in the hospital, unable to continue in that movie. While recuperating, she composed the song Ku?ulei Awapuhi. When they started singing the song, you could hear the surprised gasps of appreciation from the audience for one of the most beautiful songs that is sung by so many artists in Hawai?i. 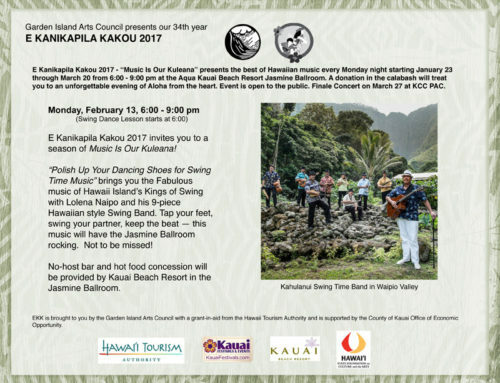 Keao Costa, well known for his beautiful falsetto as part of the group Na Palapalai, was one of the featured performers in tonight’s EKK. He spends as much time in Japan as he does in Hawai’i and he has to leave for Japan on Wednesday, so we were truly fortunate that he could be at EKK. He said that when he hears Kainani sing, he feels like he’s surrounded by nature. Yes! Her voice is a gift! His clear falsetto voice, too, as he sang Hola E Pai (5 O’ClockHula), gave us a taste of why he is so popular in Japan. He shared his background as a h?nai child with two sets of parents. He talked about his grand aunt who inspired him to become a musician. Every day for lunch, his 88-year-old aunt would go out to the ocean and fish for o’ama which she would fry for lunch. She would ask Keao to go pick her a coconut so she could wash down her o’ama with fresh coconut juice. For her, he wanted to singHome Kapaka, a song about the special beauty of Sacred Falls; his amazing falsetto voice, accompanied by the sounds of the steel, was very exciting. Tonight’s winner of the Kamoa ‘ukulele made a lot of people happy because Eric Lazar has been trying to win that ‘ukulele for years, and finally tonight with just one ticket, his name was called. Eric is one of EKK’s treasured volunteers. He races around on his wheelchair to help out in setting up the ballroom and mans the little video camera to capture all the action on stage. The second half continued with more surprises and more audience participation as Kihei led the vocals for the hula favorite Hi’ilawe. U’i Bandmann was first up to dance the hula, followed quickly by Donna Stewart, Mehana Vaughan and Vern Kauanui. He was a thirsty sponge for learning anything and all he could, and really excelled in art, so much so that when he was at UH, he got a job as a bag boy at a market in Kapahulu and was immediately promoted to making weekly sale signs instead of bagging groceries because of the skills he had acquired in art class. Art at UH kept him in school as he continued learning as much as he could in art and even got a job at Momi Cazimero’s Graphic House. When his Dad asked him what he was going to major in, his reply was ART, thinking of all the great free time he would have to create. His Dad gave him a reality check, “You can’t eat your art!” So he balanced his art education with accounting and today is busy as a certified CPA but still finding time to be one of the outstanding steel guitar players in Hawai?i. While he was at UH, his mother, Kumu Hula Ku?ulei Punua, kept me abreast of everything that Edward was involved in. She told me that she got Barney Isaacs to teach Ed how to play the steel guitar. Of course, because of his thirst for knowledge, he excels in it. He wanted to acknowledge his good friend Polei Palmeira, the wife of the late Wally Palmeira, who gave Ed the steel guitar that Wally had been given by a famous steel guitarist on the mainland. Small world. Ed asked Polei to come up for one small song. That song turned out to be a major surprise, as her soprano voice soared in the famous ?Akaka Falls. Another surprise is that Edward is married to Sean N?leimaile’s cousin, Vanessa, a lovely hula dancer. It’s a joke among Hawaiians that if you show up at any gathering, you will find someone you’re related to. In the spirit of unity and solidarity, Sean called all the participating musicians and families to come up to the stage to sing Kaulana Na Pua with the entire audience joining in. Those who did not know the words used their hands to clap the beats of the ipu heke. It was really a moving scene, and you could actually feel the sense of pride for the accomplishments of the trio who dared to dream and then acted on their dreams to create a growing body of work that featured and captured in song the musical talents and heart-felt sentiments of a people. The evening ended with Hawai’i Aloha sung a capella by the whole audience. You could tell by the buzz that was in the room that the audience had again experienced a very special evening, full of surprises and great entertainment.